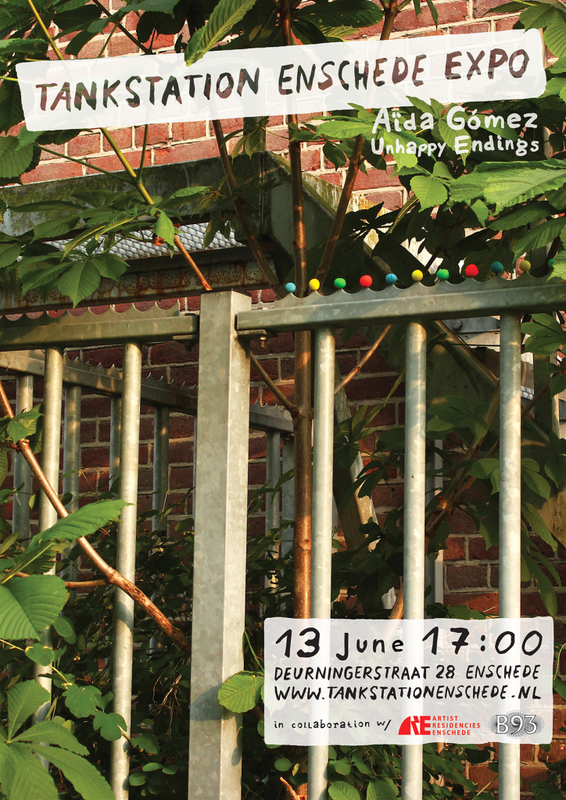 Aïda Goméz (Spanje) heeft de afgelopen 3 maanden gewoond en gewerkt als artist in residence van ARE (Artist residencies Enschede) in het pand van B93. Zij sluit haar residency af met een expositie bij tankstation Enschede. It’s about farewells. Bitter and unwanted goodbyes, which are almost all of them. In the time of low-cost flights and social networks, farewells increase exponentially, they become a daily part of our lives – something that must be accepted as a necessary evil. The places where farewells often happen are the worst: train platforms, airports, bus stations… never the parks with sunset light that we see in the movies. These none-places are full of sharp materials and strategies of protection that avert not only trespass but also a last kiss and a spontaneous embrace at risk of falling and dying of love in their blades. As we experience these spaces, we are restricting ourselves step by step , building mental walls and marking our own borders. We become impenetrable fortresses. Barbed wire, fences and other instruments installed to give a sense of security are the starting point of this piece of work. While we internalize their aggressiveness, the idea of ​​prohibiting and exclusion becomes commonplace. Concertina -barbed wire in Spanish- is a fascinating and disturbing word, it sounds beautiful and musical but it represents a lethal element for those who try to pass over it. Public opinion recalls with horror the Berlin Wall and at the same time chooses to ignore its refined and frightening contemporary versions such as the Melilla fence and the walldividing Gaza and Israel. The borders and distances between nations and people are growing. Unhappy Endings deals with current security mechanisms such as borders, fences, barbed wire and anti-user urban furniture. Many cities are designed without spaces to meet and share. These urban interventions question the real effectiveness of these limiters and ask if a concertina can really distance you from the love you are looking for, or if it will only be one more obstacle that should be overcome.